Adeniums are easy plants. The level of complexity in their care and cultivation depends entirely on how much trouble you are willing to go through and how much entertainment you intend to squeeze out of it. Some people wire the branches like bonsai, some people prune both root and branches in spring to give the plant a new look. I've even seen videos of people actually braiding the roots of young plants so they would expand that way as they get older. There are probably more bizarre tricks to make the plant do more bizarre things. 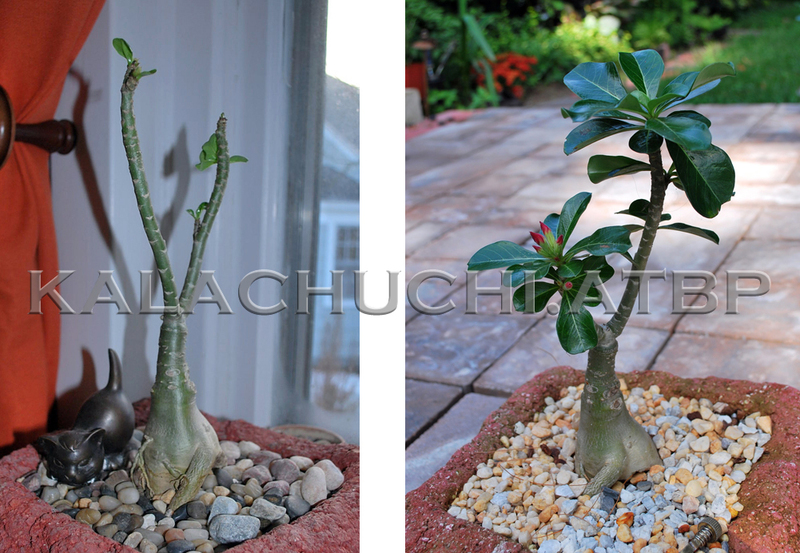 It is a testament to the versatility and incredible tolerance of the adenium. Imagine subjecting african violets to this kind of sustained torture. Personally, I am working towards keeping my regime simple. My adult adeniums were all bought online and arrived naked, i.e. bareroot. If you buy yours in the winter, they will have gone dormant and will not have leaves when you get them. In the warmer months or if they were grown in warmer climate, the leaves will probably be scraggly and disheveled. Don't worry, it will get over it. From the get go, I decided I was going to grow these plants in wide, shallow pots purely because I prefer that look. So that's what I did---I took three huge plastic nursery pots left over from some other experiment best forgotten. Then I trimmed them down to a depth of about 4 inches. The plants stayed in those pots until I was sure they were not going to keel over from transport and transfer shock. The following spring, they were repotted in various sizes of what are known are azalea pots--they are wider than they are deep. If you plant your adenium in a shallow pot and it already has an extensive root system, more of the plant will be exposed and the roots will continue to grow as the space allows below and around it. My cunning plan is to force my adult plants to grow more horizontally than vertically. You can use a deeper pot if you wish, as long as your potting medium drains really fast. The roots of this plant do not tolerate being soaked in standing water too long and will eventually get squishy from root rot. Let's say you want the roots to be a particular shape. For instance, if I wanted the plant above to more or less develop roots the size of the pot it is in, all I need to do is leave it alone in that pot for as long as it takes it to outgrow it. You know your plant has outgrown its pot when you see roots coming out the bottom drain holes. Or when it is misshaping the pot. Or when you are having to water it two to three times more than you normally have to. Or all of the above. It's no use asking what is the best potting medium for adeniums. There are as many formulae as there are recipes for cheesecake. Some people recommend specific proportions of sand, compost, tree bark, and aerating materials such as perlite or pumice. Some use animal manure, coconut charcoal, rice husks, peanut shells even styrofoam bits. In the end, you do what suits you, your climate and your watering habits. I initially planted my adeniums in pure crushed pumice since I already had that lying around. Most people use a 50-50 mix of potting soil and perlite. I don't like perlite, the keep floating to the top when I water. I tend to forget to water my plants so I don't like potting soil either because it usually has peat in it. When peat dries out too long, it becomes hydrophobic--it stops absorbing water. It takes extra amount of effort rehydrating the stuff and that is crap I don't want to deal with. Eventually, I got around to mixing up a batch of what is known in the gardening hive as the gritty mix. It takes some effort building up this potting medium but all in all it has been worth the trouble since it radically simplified the care for my adeniums. You can read my post about it here. But if you do not wish to go that way, I recommend making a medium composed of 3 parts crushed pumice and one part potting soil. If pumice is hard to find (I get mine from Amazon), you can use perlite. They float. Adeniums grow best in direct sunlight--as much as you can provide for as long in the day as possible. Since I got my adeniums in the dead of winter, they sat on the shelf of a south-facing window until spring. When night time temperatures go up to 16C, you can put them outside in part shade at first, and slowly move them towards more sun in the summer. Pick a spot where they can get as much as 6 hours of full sun. Do this gradually--one week in part shade outdoors, one week in a spot with morning sun only, one week in a spot with morning and noon sun before finally, moving them out in full 6-hour sun or more. You will notice a dramatic difference in vigor and growth. These plants once established, are happiest where it is hottest and sunniest. At the height of summer, my adeniums get water every three to four days, plus rain. But don't panic if you forget--they are tough, forgiving plants. Remember, though, that your potting medium must be fast-draining. If you put one liter of water in your pot and only a bit comes out, that means your soil is too dense and slow. Replace it! This took a considerable amount of research but in the end, I decided the simplest way is the best way. I use an all-in-one fertilizer every time I water. The gritty mix makes this possible because the water runs freely through the potting medium and does not sit in a stagnant pool at the bottom of my pots, eventually burning the roots of the plants. This way, I don't have to keep track of fertilizing schedules. I use Dyna-Gro FOL-100 Foliage-Pro Liquid Plant Food with 9-3-6 NPK ratio. The direction said to use a quarter teaspoon for a gallon of water, I use an eighth and fertilize every week. I have never actually seen anyone taking up residence in my adenium plants, other than spiders. But spiders are your friend--they will eat insects trying to colonize your plant. Having said that, I have a weak solution of soapy water that I spray on my adeniums occasionally, whenever I get paranoid and suspect nefarious buggy activities. A couple of drops of non-detergent dish soap in a bottle of water has been adequate. Maybe I will get a real infestation and will have to launch a full-blown chemical warfare to defeat it. So far it hasn't happened. Pruning is a lot of fun! Again, this is based purely on aesthetics. If you don't like the way your plant looks, you can always hack off a branch here and there, either to remove an offensive outgrowth or to encourage branching at certain points. Pruning can also encourage vigorous growth since you are introducing a tremendous amount of stress and the plant will react accordingly. Sometimes it can also trigger bloom. I use a box cutter, wipe it down with alcohol and slice diagonally so water does not bead on top in case it rains before that cut dries out. Just to be safe, sprinkle a bit of ceylon cinnamon (a mild fungicide) to prevent fungal growth whilst the injury is drying. Do this when you know it isn't going to rain everyday, right? Go to this site for more information, it was certainly useful to me.